I served this with egg noodles but it would be equally as nice with either some plain or egg fried rice. Add all the ingredients for the sauce together in a bowl or jug. Add the stock bit by bit last to keep the sauce nice and thick. Pop to one side. Spray a wok or large frying pan with 1kal, add chicken, season and fry for 6-8 minutes until cooked through. Remove from pan onto a plate and pop to one side. In the same pan, spray again with 1kal and fry the onion, pepper and sugar snap peas for 4-5 minutes until they soften. Then add the garlic and ginger and fry for another few minutes. Add the chicken back to the pan with the quartered pineapple and then add the sauce. Simmer to let the sauce heat up and thicken for around five minutes. Squeeze over the juice of ¼ lime. In a separate frying pan (or put the meat sauce in a bowl and use the same frying pan), spray with 1kal and stir fry the noodles for 5-7 minutes. Season with salt and pepper, add in a little of the sauce from the meat mixture and heat through. Squeeze over ½ lime. Serve meat and sweet and sour sauce on top of noodles and pop ¼ lime on the side of each. Ah that’s so lovely to hear! This was a really easy dish to cook and very filling for 2 people, I did use 200g of brown rice (100g per person of uncooked rice) as I didn’t have any noodles. Oh wow….even my very fussy & particular 18 year old daughter was impressed with this…delicious. 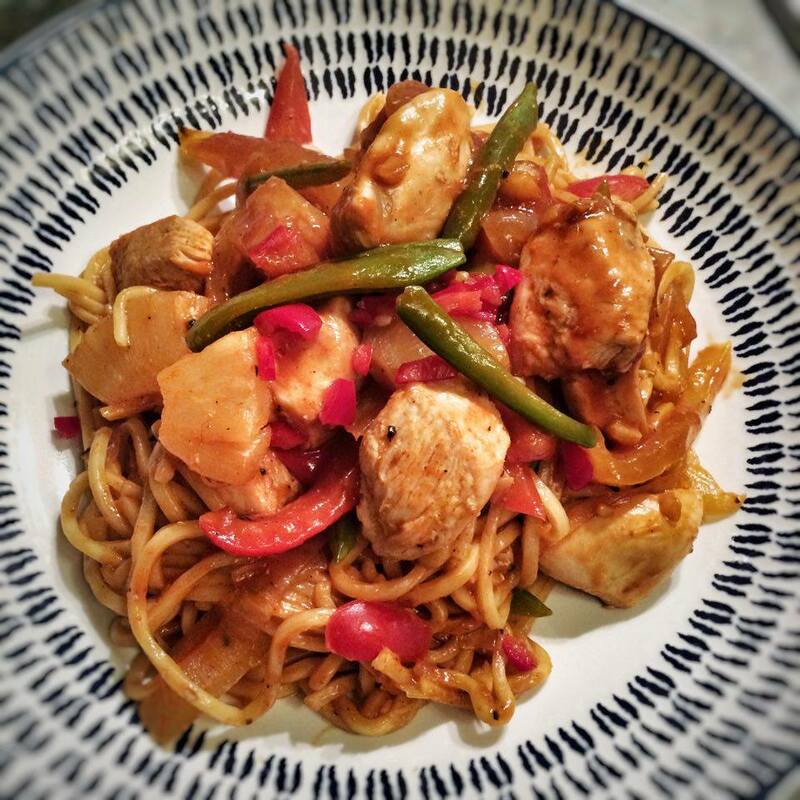 At this rate I will never send out for another takeaway ever…your recipes are the bomb ! If I did this for 4 people would I double up everything on the recipe.